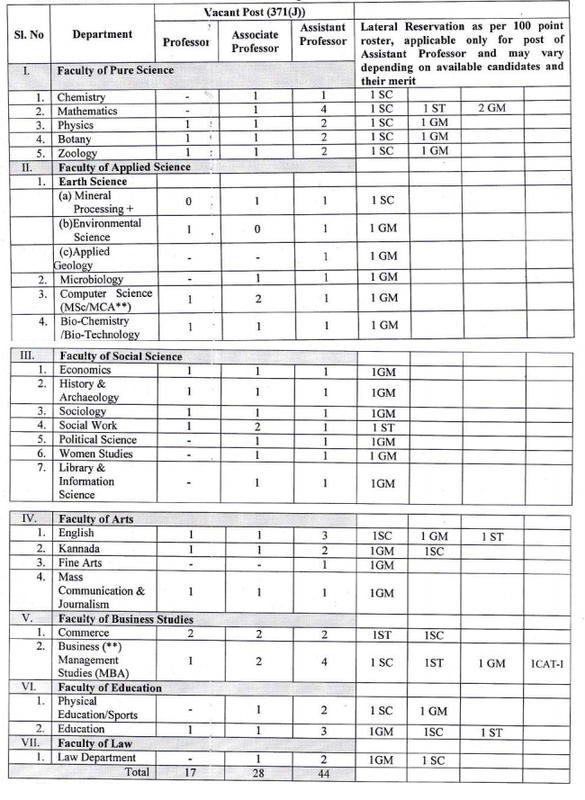 Vijayanagara Sri Krishnadevaraya University, Ballari has advertised for the recruitment of Teaching Faculty- Professor / Associate Professor / Assistant Professor jobs vacancies. Interested and eligible job aspirants are requested to apply on or before 30th June 2018. Check out further more details below. University Profile: Vijayanagara Sri Krishnadevaraya University (VSKU) is a State University established by the Government of Karnataka under the Karnataka State Universities Act 2000. It is an affiliating university with about 100 affiliated colleges offering both undergraduate and post graduate programs. The university covers the districts of Ballari and Koppal. The region under the jurisdiction of the university is considered economically and educationally backward compared the national and the state average. Application Fee: DD for Rs.300/- (Application fee) and DD for Rs.800/- (Rs.4001 for SC/ST/Cat-I candidates)- towards processing fee for the post of Assistant Professor. DD for Rs.300/- (Application fee) and DD for Rs.1200/- (Rs.600/- for SCiST/Cat-I candidates)- towards processing fee for the post of Professor and Associate Professor. Ballari on or before 30.06.2018.
form should be enclosed to all eight sets of application. advance copy may be sent directly. (4) The envelopes containing application should be superscribed as "Application for the post of___________________________in______________________"